l.a.Eyeworks makes a spectacle splash in Stylu! The Taiwanese magazine features a frame fest of statement-making eyewear, complemented by l.a.Eyeworks' own custom cases and one of our amazing artist designed cleaning cloths by Catherine Opie. Among the fray are classic favorites Pick Up, Director, and Kowalski, and bold new designs Rebar, O Connell, and Masonite. "C" Gets a Pick Up! How divine! 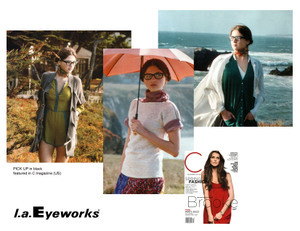 l.a.Eyeworks was just featured in the March 2008 issue of C magazine, THE luxury mag for southern California!! The Pick Up frame was featured in their main editorial spread, and looks absolutely MARVELOUS! This featured photo collages the three striking images, but you can check out the full page version in the l.a.Eyeworks Gets Exposed photo gallery over to the left! Geek chic?...très fabuleux!